Like most expecting mothers, I spent my pregnancy reading and researching as many things as possible to be the "perfect mother". During that time I found my favorite unbiased go-to for info on the best and safest products and produce for my child, The Environmental Working Group. Each year they provide numerous unbiased list of the safest and/or environmentally safe sunscreens, cleaning products, paints, produce and even cosmetics... and really so much more! One of those studies is the, EWG's Shopper's Guide to Pesticides in Produce™. This year's report had so many useful (and scary) facts, I decided to post the highlights to help you understand why so many groups are fighting to push out pesticides and toxins from use on commercial produce. 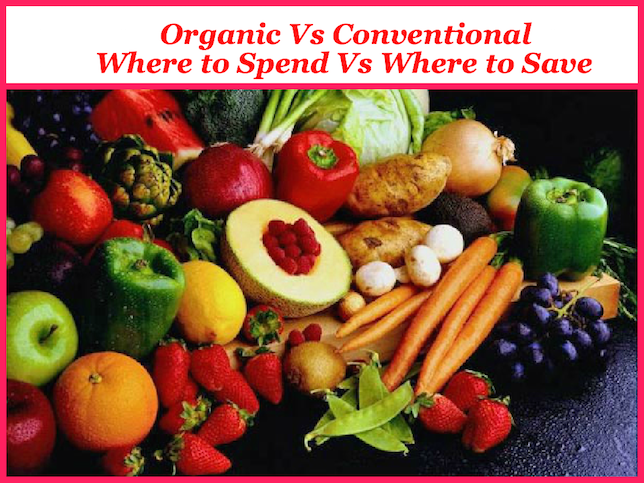 I've also added easy printable "pin" to help you know where to spend and save on organic vs. conventional produce according to the EWG's findings using data from the U.S Department of Agriculture. FACT: EWG's Shopper's Guide to Pesticides in Produce calculates that USDA tests found a total 165 different pesticides on thousands of fruit and vegetables samples examined in 2013. FACT: In 2012, the American Academy of Pediatrics issued an important report that said that children have "unique susceptibilities to [pesticide residues'] potential toxicity." The pediatricians' organization cited research that linked pesticide exposures in early life and "pediatric cancers, decreased cognitive function, and behavioral problems." It advised its members to urge parents to consult "reliable resources that provide information on the relative pesticide content of various fruits and vegetables." FACT: Nearly two-thirds of the 3,015 produce samples tested by the U.S. Department of Agriculture in 2013 contained pesticide residues - a surprising finding in the face of soaring consumer demand for food without agricultural chemicals. Fact: Two American food crops - leafy greens and hot peppers - are of special concern for public health because residue tests conducted by the U.S. Department of Agriculture have found these foods laced with particularly toxic pesticides. Among the chemicals at issue are organophosphate and carbamate insecticides. These are no longer detected widely on other produce, either because of binding legal restrictions or voluntary phase-outs. Clearly, there is good reason to spend a little more on Organic leafy greens and hot peppers, but what about everything else? Using the U.S Department of Agriculture's findings on pesticide levels in the 48 most common fruits and veggies consumed in the average household. 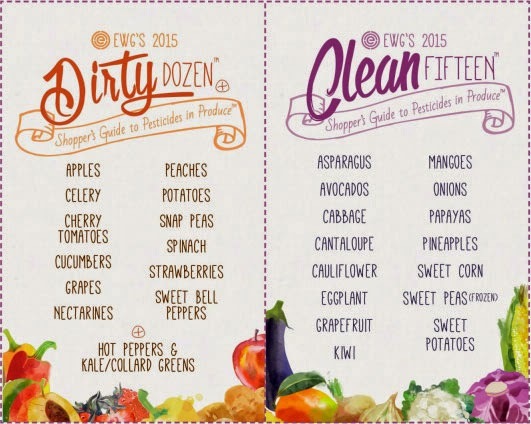 To make understanding what produce to buy organic and what to feel safe buying conventional, the EWG singles out produce with the highest and lowest pesticide loads for its Dirty Dozen™ and Clean Fifteen™ list. Pin me or print me off, here. This year's Dirty Dozen™- (Produce with the highest load of Pesticides) is comprised of apples, peaches, nectarines, strawberries, grapes, celery, spinach, sweet bell peppers, cucumbers, cherry tomatoes, imported snap peas and potatoes. This years Clean Fifteen™ list (produce least likely to hold pesticide residues) consists of avocados, sweet corn, pineapples, cabbage, frozen sweet peas, onions, asparagus, mangoes, papayas, kiwis, eggplant, grapefruit, cantaloupe, cauliflower and sweet potatoes. I'd love to know what you think! Are you organic crazy, or do you buy according to pesticide ratings. How do you clean your conventional produce to ensure pesticide free consumption?